Do-It Carry Handles are ideal for carrying oddly-shaped or bulky packages. Gerber found that Do-It’s Carry Handle works great for its First Essentials Baby Bottle product line—as a handle and also as a hang tab! 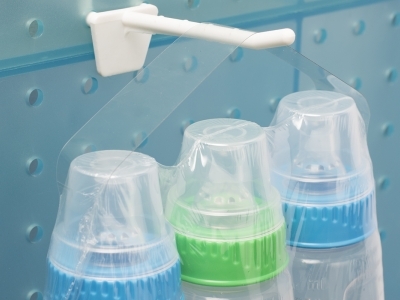 First, the R-SHT Carry Handle fits perfectly across the package to help tote the baby bottle three-pack. Second, Gerber gives stores the option of displaying the bottles on a shelf or hanging on a peg hook.